A yo-yo is in the hands of someone with the necessary skills keeps on coming back, over and over again. In the field of human psychology we call this ability to bounce back, Resilience. Along with the allied concept of Grit, the presence of Resilience helps to determine those who succeed in having a happy life, despite the ‘slings and arrows of outrageous fortune’, from those who struggle. Resilience is the emotional ability to adapt to stress and adversity, and to function well despite the knockbacks that life throws at us. Resilient people seem to rise above life’s difficult experiences with ease. For some reason Resilience appears to be in short supply. Their coping strategies help resilient people to avoid the increasing tide of anxiety, and depression that has been sweeping the western world, over the last two hundred years. An epidemic of distress, and wasted opportunities that has become even more pronounced over the last fifty years. The good news about Resilience is that it is a learnable skill, and one that is found much more often than some might think. The seeds of greater resilience lie within us all. Resilience is more of a process, a way of living that helps the individual to deal with life’s adversities, than a personal, inborn trait. The characteristics of resilient thinking and behaviour enable us to find our way around a crisis by using a variety of coping skills and strategies. Which we can either improve and develop, or learn afresh. We develop our world view, and pick up our skills, and beliefs about the world as we grow and develop within our families. This developmental trajectory is fairly robust, and can survive many events that might cause it to go off track. However it does depend on good interpersonal relationships to reach its full potential. If our parents display poor coping strategies it is highly likely that we will as well. We pick up many of our skills through mimicry of what we see as we grow up. Psychological resilience involves a variety of processes that we use to cope well with life. A conglomeration of adaptive thinking and behaviours that we use, not only to adapt to our environment, but also to cope with the predicaments in which we find ourselves. It allows us to cope with adversity, and to do so while avoiding the long-term, harmful effects due to stress. There is recent research suggesting that stress and depression are modulated by the same changes in brain chemistry. So if we can improve our ability to handle stress we should be able to reduce the risk of developing depression as well. One definition of resilience describes it as “..patterns of positive adaptation during or following significant adversity.” It uses pretty ordinary sounding strategies and abilities to keep us safe, reducing the impact of stressful life events and at the same time increasing our sense of wellbeing and our quality of life. Unfortunately, during my daily work with struggling adolescents, resilience seems to be in very short supply. Events that would seem insignificant to many former generations seem to bring some young people’s lives to a complete standstill. Some struggle to cope with minor relationship difficulties or the everyday hassles of normal human interaction. Yet I also see many young people who seem to take even major problems such as poverty, abuse or parental divorce in their stride, managing to keep up with their academic work and keep up their friendships and ability to enjoy life despite major difficulties. A yo-yo comes all the way up again because we add energy to the string at the crucial moment. 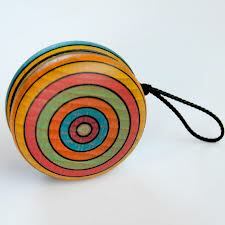 Without the tug on the string, the yo-yo ends up hanging, quite literally, by a thread. To a certain extent this is the same for resilience and coping. If we believe that we have some power to influence the events in our life, we will be able to make an effort to minimise our problems and reduce their impact. Too many people seem believe that they are almost powerless. This means that they find themselves unable to act in an effective way, and are swept along by the tide of events. This makes their perception that they cannot cope even stronger. This encourages them to further believe they are without influence to change events and more likely to give up. So, what are these resilient skills, these protective factors that we can all improve? The ability to cope with strong emotions without being overwhelmed. Resilience is not about ignoring or cutting off our emotions. Strong emotional self-regulation. Healthy self-worth and self-esteem. Self acceptance of our strengths and weaknesses. Self confidence, seeing ourselves as having agency in our life. Coping with negative thoughts and beliefs. Having good problem solving strategies. Strong social skills such as assertiveness, communication skills and empathy. Showing persistence or Grit, the tendency to keep on getting up and trying agin each time we are knocked back. Grit in childhood is one of the main predictors of a successful and happy life. These are all abilities that we can further develop through practice and training. Such training already features in many stress management programmes and psychological therapies. There are strong arguments for extending this kind of training into schools and other areas of life. If we are to learn some of these skills, we might need some body else to help us become aware of what we currently do, and how we might improve our coping abilities. Some are things we can practice for ourselves, and although it might seem an easy task when we see them written down, it can be quite to hard to incorporate these activities and ideas into our daily lives as they require practice and persistence. In the leaflet published by the American Psychological Association called “The Road to Resilience”, ten recommendations were made to develop and maintain resilient coping skills. To have good interpersonal relationships, especially with our family, friends and other people. Being with people we like, doing things that we like, helps us to maintain a positive mood and sense of wellbeing. Acceptance. Some things are out of our control and to worry about them is a good way to become overly anxious. The Nun’s prayer asks for the wisdom to be able to see the difference between the things that we can change and the things we cannot. When adversity strikes we need to avoid seeing problems as being too huge for us to be able to find solutions. We need to look carefully to see where we can start to look for solutions. Set realistic goals. Break solutions down into small steps, and work at them steadily over time. Take active steps to improve any adverse situation. Do not bury our heads in the sand to avoid thinking about our difficulties. We can step out of the way of an oncoming train. Look for any positive or constructive elements in the problem that we can use to develop our skills or our selves. Be confident in our abilities to resolve external problems, and avoid undermining ourselves. Maintain and nurture a positive view of ourselves. Use positive self talk to help us manage the situation. Develop a sense of perspective. Focus on the bigger picture. Keep a balanced view. Avoid getting bogged down in tiny irrelevant detail as this can paralyse our ability to take action. Focus on concrete goals, working towards a positive outcome to stay hopeful and optimistic about the future. Avoid catastrophising the situation, things are rarely, if ever, as bad as we can imagine. Self care. Look after ourselves. Physically, emotionally and socially. Sleep well, eat healthily and build relaxing and enjoyable activities into our daily routines. One thing that has been shown to be useful here is meditation. The oracle at Delphi told all comers to “Know thyself”. If we are aware of our personal responses, triggers, thoughts and beliefs, we can gain a measure of control over them. This will then give us the freedom to act out of awareness when adversity strikes, as opposed to reacting automatically to events. We might even develop the ability to react to events long before they become overwhelming. We can come to recognise that we are able to cope when things go wrong. Resilience can help Friedrich Nietzsche’s statement, “That which does not kill us, makes us stronger.” develop into our personal reality.